Doolittle’s childhood home was located just across the plaza from the Library, where City Hall now stands. Her innovative and experimental poetry and prose established her as a leading Modernist artist in the 1910s and 1920s. 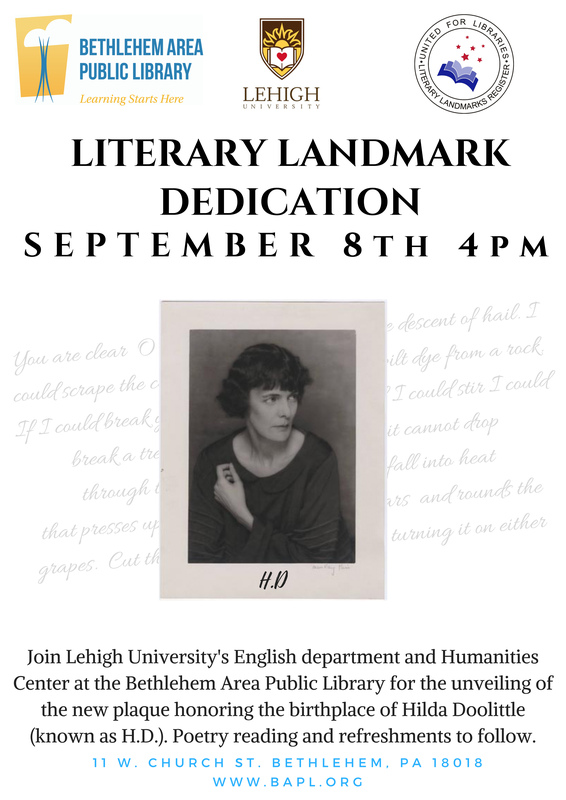 She remains the Lehigh Valley’s most important literary figure. The Literary Landmarks Association includes homes of famous writers (Tennessee Williams, Marjorie Kinnan Rawlings, William Faulkner), libraries and museum collections, literary scenes, and even “Grip” the Raven, formerly the pet of Charles Dickens and inspiration to Edgar Allan Poe and now presiding (stuffed) at the Rare Books Department of the Free Library of Philadelphia. The event on September 8 is to be held at the Main Library, 11 W. Church Street. For more information email jberk@bapl.org or call the Main Library at 610-867-3761 x215.